It is my understanding that MariaDB will be developed somewhat independently from the core MySQL branch. That is, it will not be a "set of patches on top of a MySQL release". I'm not sure how this should look in your tree. I don't know that much about the other versions. I know that the current facebook version is based on MySQL 5.1 and I expect them to switch to 5.6 soon. A lot of companies have an branch which is mainly used internally, I don't know if we should include them. There should be a line between MariaDB and Percona Server, both ways. MariaDB takes XtraDB, Percona Server took the group commit for 5.5. 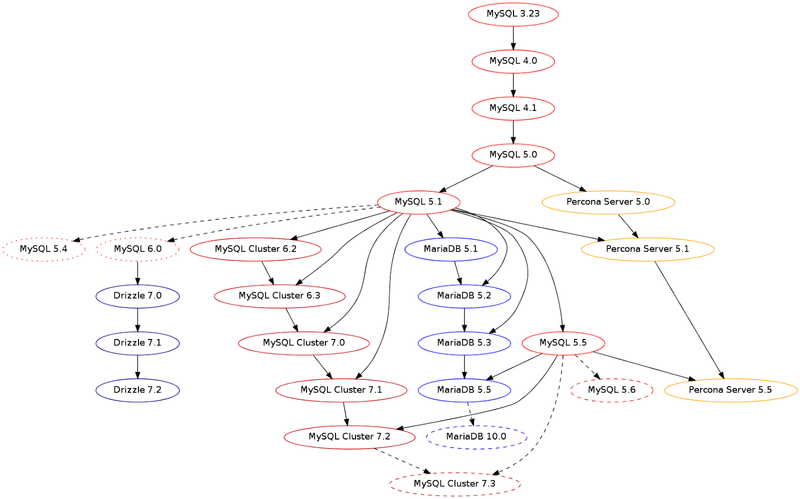 There should be links from MySQL 5.4 to MySQL 5.5 (InnoDB-related scalability improvements) and from MySQL 6.0 to MySQL 5.6 (optimizer improvements originates there). Yeah, ICP, MRR, BKA etc all are 6.0 features that are ported to 5.6. And group commit and some other patches are incorporated into Percona Server from MariaDB. As for things like the Google Patches I think they are relevant, since MariaDB and Percona Server both include the userstats patch (at least I think MariaDB includes it)..